Braving a scorching 41 degree summer heat, thousands of men and women flocked to hear Tamil Nadu Chief Minister J. Jayalalithaa attack the DMK at an election rally here on Wednesday.Wearing a sari in her favourite dark green colour, Jayalalithaa targeted the DMK but made no reference to any other party or alliance contesting the May 16 assembly elections.In a speech that lasted around 45 minutes, the AIADMK chief dwelt at length with the free schemes and women welfare measures of her government. She came down heavily on the previous DMK government.Jayalalithaa said her government gave women free mixers and grinders as well as fans so as to reduce their household workload.She said the AIADMK government had fulfilled all the 2011 election promises and also implemented welfare schemes that were not promised such as Amma Medical Shop, Amma Mineral Water, Amma Canteen and more. The DMK, she said, was made up of "goondas". The DMK's rule 2006-11 was nothing but Jungle Raj when land grabbing was rampant and the police were prevented from acting.According to Jayalalithaa, properties worth Rs.3,628 crore grabbed during the DMK rule were restored to the rightful owners.Among the thousands who heard the chief minister was Amudhavalli, 65, from Yercaud. 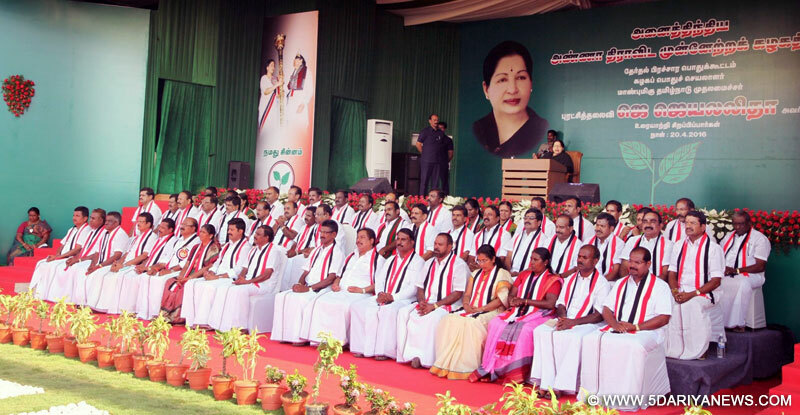 She said she had been waiting for several hours at the rally venue to see and hear Jayalalithaa.Several huge cardboard cutouts of Jayalalithaa were erected at the venue. Salem district lies around 340 km from Chennai.A large section of the crowds had been either ferried to the ground or had come on their own from nearby areas.Several trucks and buses had stopped near coconut groves so that AIADMK members and supporters could have their lunch.The crowd gave a rousing welcome to Jayalalithaa as she arrived in a helicopter.The AIADMK leader introduced her candidates contesting the polls from Salem and surrounding constituencies. She also introduced the seven who are contesting from Kerala.